Our large venue, spacious grounds and free parking make us an ideal choice for both large scale events and intimate celebrations. We are able to organise a number of special events such as banquets, company dinners, corporate functions, fundraisers, engagements, weddings, birthdays, first month celebrations or any other special celebration. We can customize events to suit all cater to all budgets and tastes. Our individual treatment of each event and attention to detail, ensure your events are executed seamlessly. 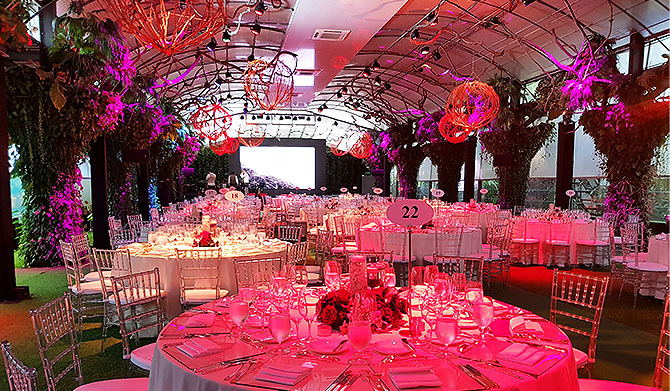 Our Royal Greenhouse Garden is able to cater to large scale events. Vertical indoor landscaped garden spilling over with tens of thousands of living plants and herbs, forming the backdrop. Take your event to the next level with us. We have extensive experience in company D&D, event/product launches, corporate seminars, conferences, weddings and birthdays. Take your corporate event to the next level with us. We have extensive experience in company D&D, event/product launches and corporate seminars and conferences. Whether you’re interested in hosting a meeting, conference, exhibition, product launch, gala dinner or cocktail party, our reputation for professional service, attention to detail and top quality menu are why our customers keep coming back. Our generous function and event spaces are capable of hosting large scale events. We will work with you in the lead up to your corporate event to ensure all the details are taken care of. Selecting a wedding venue is one of the first and biggest decisions you will make as an engaged couple. Let us help you plan your perfect wedding. We cater to all themes and budgets. We are fully equipped to handle all aspects of your wedding including professional décor, state of the art sound system, personalized menus. We are also able to work with you and your wedding planner to host the wedding of your dreams. If you are looking for the perfect venue for your next birthday celebration, look no further than our versatile venue. From themed adult birthday bashes, milestone birthday parties for your loved ones – we are able to make your event special and memorable. Kids Birthday Celebrations or Baby’s First Month Celebration – Kid friendly grass carpeted flooring throughout the venue, garden themed décor and balloons, spacious grounds for hire and placement of bouncy castles, inflatable slides, make this venue one that will make every kid’s dream come true.